This is one of those cards I've had in my head for awhile, and it actually turned out how I pictured it! Love it when that happens! This layout is from my super-talented friend Kristina. I inked up Doodle jumbo wheel with wild wasabi ink and rolled it on certainly celery cardstock. I took my white gel pen and filled in and highlighted the stamped image. 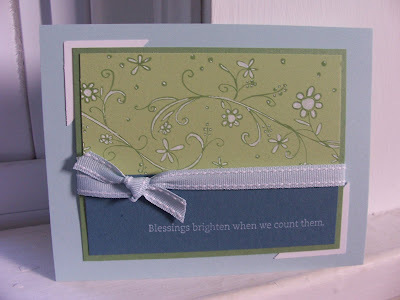 The sentiment is stamped in white craft ink on blue bayou cardstock. Love the calmness to this card, what sentiment is this from, love it! Thanks AJ! The sentiment is from Stem Silhouettes. So pretty! The white gel pen to highlight your image, plus the green/blue color combo just makes this an awesome creation! oh yay...i'm SO glad you decided to join the blogging world! i'm a newbie to it too :) i'm adding you to my blogs i visit list because i love your work!! this card is adorable - great colors!